Instead of viewing innovation as a collection of various processes, methods and tools, the author makes a strong case for viewing it as a complex, integrated system that needs to be designed, built and operated as such. This system needs to balance the competing needs of the operational business units and the strategically oriented corporation as a whole, of the quarterly demands of wall-street and the long-term vision of other stakeholders and society. At the center of this system is the Portfolio of projects the company is working on. The portfolio represents the company’s future. It is the sum total of where the company is going and the future of the company is dependent on the decisions made about what is in the portfolio and the resources applied to each project in the portfolio. Discovery, Incubation and acceleration efforts all need to work to create the ‘right’ portfolio, using the metrics, governance and organizational structures that will cause this to happen, despite the many competing needs and desires that result in natural tensions within the organization. 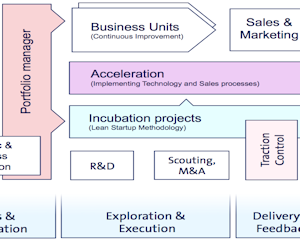 Getting the innovation system ‘right’ results in the ‘right’ portfolio to deliver new offerings in 1, 3, 5 and 10 years that fulfill a strategic vision. This article provides a nice introduction to some of the factors that can make this happen.